In the beginning, according to Waldeloir Rego, at a roda de capoeira there were only the movements without any music. 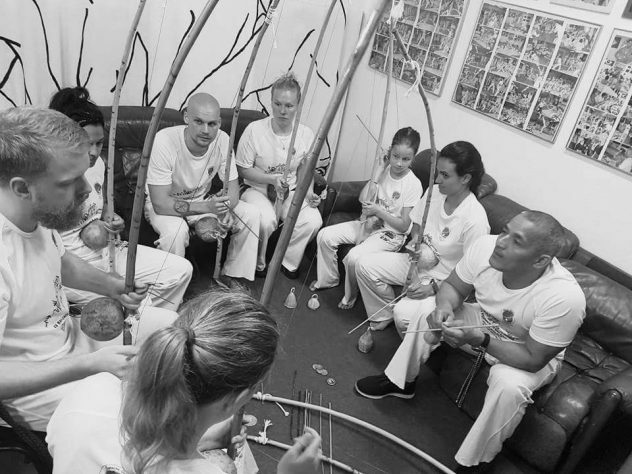 As time passed, instruments were introduced to the roda de capoeira. Consequentially, the music adapted to the play of capoeira and now they are tightly connected. A fixed ritual is followed during the roda de capoeira…..
2 pandeiros an atabaque, agogo and a reco-reco. The gunga berimbau with its deep sound commands the roda. According to tradition, the gunga both starts and finishes a roda. It is the maestro and the authority of the ritual of capoeira. Before ‘playing’ two capoeiristas lower themselves at the ‘foot of the berimbau’ and wait for the person playing the gunga to let them start. The gunga berimbau also determines the beat and speed to be followed by the other berimbaus. Usually the gunga is played by either the mestre or an experienced capoeirista. Medio berimbau marks the rhythm while the viola berimbau, with its high pitched sound, is used exclusively to improvise. The atabaque and the pandeiro are used only for rhythm. There are different ways of organising the percussion of capoeira. Some groups include, or not, the agogo, and the reco-reco, others, use different beats with each berimbau. At Mestre Bimba’s gym the roda was accompanied by one berimbau and 2 pandeiros. In the ‘Angola’ rodas, such as the rodas of Mestre Pastinha, the percussion was formed by 3 berimbaus, 2 pandeiros, one atabaque, one agogo, and a reco-reco. Usually, during Angola rodas, the capoeiristas play their instruments seated on a bench. There are no rules existing as to the formation of instruments in capoeira. Even clapping could be different from group to group. Some use ´Bimba´s clap´, and others use ´samba de roda clap´. There are innumerable beats of the berimbau. There are those that could be called general because they are used by all groups of capoeira. There are others which belong to particular Mestres or gyms. There are also those that are slightly altered and receive different names or even, the same beat with different names. At the moment the most common beats in a roda are: Angola, Benguela, São Bento Grande, São Bento Pequeno, São Bento Grande de Bimba and Iuna. The beat determines the style of play in the roda. In Angola players should wait at the foot of the berimbau when the ´ladainha´ is being chanted. The most common chants in capoeira are: ladainha, quadra, chula, corrido. Ladainha: is a chant of slow rhythm with a fixed chorus which is repeated throughout the chant. The ladainha tells a story, usually about slavery, a famous character from capoeira or famous mestres. Quadra: is an integral part of regional capoeira. It’s sung faster and its 4 verses, which all rhyme, culminate in the last verse which has a definite end to the theme of the quadra. It usually finishes with a ‘warning’ such as : ‘camara’, ‘aruande’, ‘volta ao mundo’, etc. Chula: is a short improvisation to introduce the corridos or ladainhas. Corrido: its verses are very short with an immediate response from the choir.